Your shoes undergo a lot of wear and tear, as they come in contact with all types of surfaces on a continuous basis. The sole, being on the very bottom of the shoe, is constantly under strain and comes into contact with dust, dirt, mud, grass and all that is part of the ground you tread on. So, the lifespan of your footwear depends to a great extent on the quality of the sole and how you maintain it over time. Cleaning it and addressing any damage as soon as it occurs will ensure your shoes last for much longer, and function well. Not all soles are the same. It can be made from different types of materials, like rubber, leather, plastic and PVC, based on the intended use for the footwear. So, how to clean the soles of your shoes will depend on the particular material used in the sole of a pair of shoes. We will explore the following topics during the course of the article. The sole of a shoe is that part of the shoe that comes in contact with the ground. Hence, this is the part that wears out fastest. Good soles are designed with durable, sturdy materials that are suitable for the intended purpose. This increases its life span. Nonetheless, all soles will eventually wear out with continuous use. The sole basically supports the feet and provides a protective layer to separate it from the ground. Soles can be soft or hard, depending on the purpose. For instance, running shoes have lightweight but sturdy soles, while casual daily wear shoes often have PVC soles. The design of the sole is usually to provide required friction and also to ensure it is comfortable when worn. For more information on how soles are designed for different purposes, visit this article. Rubber: Used in classic hiking boots to provide required traction against the ground, as well as in casual and daily wear shoes, rubber outsoles are rugged and durable. They are also weather resistant and endure wear and tear efficiently. Cork nitrile: Cork soles mixed with rubber form a soft and light sole with a smooth finish. Crepe rubber: The synthesized version of rubber is milky yellow in colour with a crinkly finish and are heavy. Leather soles: Traditionally a very popular option, leather soles are smooth. They are vulnerable to water damage and require extra maintenance and care to continue looking brand new. PVC: This synthetic sole is very common in casual wear shoes. It is durable, resilient to damage and very easy to maintain. To clean the soles of shoes efficiently, you should first try to identify the type of sole that is present on your shoe. The recommended solutions below are suitable for most types of soles. However, they may not be suitable for leather soles and any other soles that are not waterproof. To ensure no irreparable damage is caused to the shoes, first understand the type of sole before proceeding with a cleaning method. Since shoe soles can be pretty dirty, it is always best to clean them in an outdoor area or a space that you have cleared out. Set down newspapers or plastic sheets to hold all the debris that will be released. It is also suggested to use a pair of gloves to prevent the cleaning materials from entering your skin. Some of the most effective methods for cleaning the soles of shoes are as listed below. Dirt that enters into the various dents and depressions in the sole can be knocked out when dry by hitting the sole against a hard surface like a wall or floor. In case it doesn't entirely dislodge the dirt, use a brush to enter the crevices and scrub out the excess dirt. For waterproof soles that have stubborn dirt in it, soaking it in laundry detergent solution should prove effective. Fill a tub or basin with enough water to soak the entire sole, and leave it in there for some time. The dirt should dissolve in the liquid and leave you with a clean sole. If there are particles that remain, you can use a brush to scrub them out. Ensure that the laundry detergent you use for the purpose is mild and doesn't cause any discoloration to the fabric part of the shoe, if any. Certain terrains like freshly tarred roads, fields or forest areas can leave sticky things attached to the soles of your shoes. To clean the soles in this case, it is first essential to eliminate the sticky substances to the maximum extent possible. Use a plastic knife to scrape off as much of the material as is possible. You can also use a brush with rough bristles to scrub off the residue. Next immerse the sole in warm soapy liquid to loosen the bits that remain. For materials like tar that adhere to the sole, consider using an anti-grease solution only in the area where the tar is concentrated. This will dissolve the liquid gunk and help to get it off the sole. Gum that lies around on the road can quickly stick to the sole of a shoe. The worst part is that it will further attach itself to pesky hairs, dust and all other types of mystery stuff and form a sticky layer on the sole. This should be cleaned off promptly. If the gum is still in a sticky condition, use a paper towel to remove as much of it as is possible. If it has turned hard, scrape it off with a plastic knife or metallic edge like seen in this video by Electrolux AU. For rubber soles, you can rub vinegar or rubbing alcohol over the gum area and ply it off the surface. 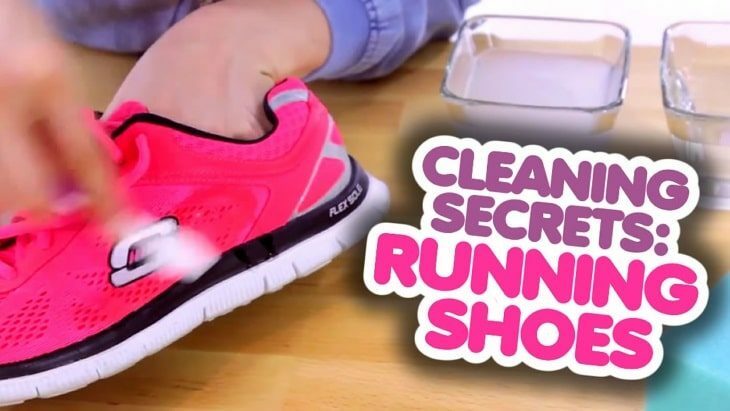 Another method to get rid of any gum that remains is to chill the shoe. Place it in a bag and stuff it in the freezer for an hour. The gum will become brittle, and you should be able to break it off afterwards. White colored shoes are very vulnerable to stains and scuff marks. The soles are no different. So, if you have a favorite pair of white sneakers, it is likely that you will have to address various types of stains on the sole on a frequent basis. Apart from following any of the above discussed methods, it also becomes necessary to use more targeted methods to restore the pristine white look to the soles in this case. For white shoes, use bleach or a whitening laundry detergent with soapy water to wash the sole. You can also use a paste of baking powder and water on the area to remove the stain and restore the original colour. Vinegar sprayed on the area can also achieve similar results. This video by Anthony DelucV suggests how you can keep your white shoes white. Suede, fabric and leather shoes have delicate soles that require special care. For stains and dirt that adheres to these soles, try to brush or scrape it out with a plastic knife. You should only moisten the soles of these shoes to remove any hard stains and never soak it or it can be damaged. Use a mixture of vinegar and water in equal proportions to mist the area. Alternately dip a soft cloth in this mixture and apply on the stained area. Moisten the leather sole by rubbing this area in circles. Once the stain comes out, leave it outside to completely air dry. You can then apply a leather conditioner to the sole, to keep it intact. You can also use cleaning agents specifically designed for leather shoes to achieve effective results. This post on the Poppy Barley website discusses this option in detail.